Notable wins on the opening day of play in the Men’s Singles qualification tournament that precedes the 2017 ITTF Challenge Spanish Open in Almeria; on Thursday 23rd November that success continued for Italy’s Jordy Piccolin and Kazakhstan’s Denis Zholudev but not for Nigeria’s Olajide Omotayo nor for Canada’s Marko Medjugorac. Jordy Piccolin and Denis Zhoudev remained unbeaten, topped their respective groups and thus reserved places in the main event. On the opening day of play Turkey’s Ibrahim Gündüz, at no.230 on the current Men’s World Rankings had been beaten by both Olajide Omotayo, named at no.502 (11-7, 11-8, 11-7, 10-12, 13-11) and by Denis Zholudev who stands at no.442 (11-8, 11-9, 8-11, 10-12, 12-10, 11-8). Top place in the group at stake, Denis Zholudev accounted for Olajide Omotayo in five games (11-7, 11-8, 11-7, 10-12, 13-11). Success upon success for Denis Zholudev, it was the same for Jordy Piccolin. Listed at no.510 on the current Men’s World Rankings, in his opening contest on the first day of action, he had beaten Belgium’s Lauric Jean, ranked no.249 (11-6, 8-11, 10-12, 11-7, 13-11, 8-11, 11-8); one day later, he completed his group stage matches with victory over Sweden’s Oscar Perman, named at no.431 (11-7, 11-6, 11-7, 10-12, 11-3, 11-6). The lowest rated player in the group, the 20 year old Italian had finished in first place; moreover he had reserved a place in the main event. Alas, it was not the outcome for Marko Medjugorac, ranked no.498; on the first day of action he had beaten Scotland’s Gavin Rumgay, standing at no.250, in seven games (11-6, 13-11, 11-6, 7-11, 4-11, 6-11, 11-8). On the second day of proceedings, he was beaten by Sweden’s Anders Ericsson, listed at no.415 in the global order, in five games (11-9, 15-17, 12-10, 11-6, 12-10) In his initial contest, Anders Eriksson had experienced a full distance defeat when facing Gavin Rumgay (8-11, 4-11, 8-11, 12-10, 13-11, 11-6, 11-8). Thus games ratio determined the outcome; Anders Eriksson secured first place (7:5), next in line came Gavin Rumgay (7:7) with Marko Medjugorac who had started the day with such high hopes in third position (5:7). Surprise first places and there were more; against expectations Spain’s Carlos Caballero and Endika Diez topped their groups, as did Austria’s Alexander Chen and Australia’s Liu Xuqi, alongside another name that was no surprise at all, Japan’s Kaii Yoshida. 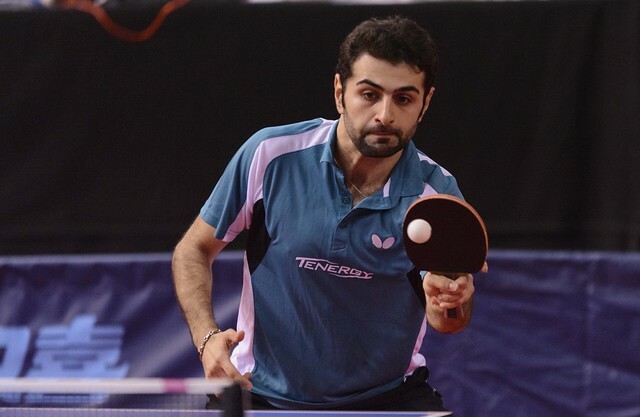 Returning to international duty, he has no current world ranking but was recently runner up in on the ITTF Challenge Series in Poland and has two ITTF World Tour titles to his name. Unbeaten on the first day of play, in his concluding group stage contest, he overcame Germany’s Denis Klein, ranked no.297 (11-3, 11-8, 11-5, 11-6) to secure first place in the group.